I love this Happy Birthday card. It has an elegant, timeless look and feel to it, and I especially like that the greeting could be switched out for almost any other sentiment. It would make a beautiful sympathy card, a heartfelt “thinking of you” card, a perfect anniversary card . . . you name it, it’s just a versatile card. And I love the Kraft gift box. 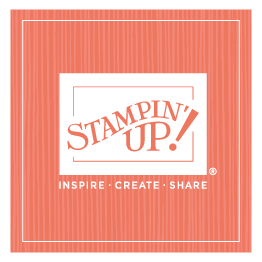 You may not be able to tell by looking at it, but the flower on top is made of packing paper (from our Stampin’ Up! orders) run through the Fun Flower Bigz Die and scrunched up, topped by a bunch of Calypso Coral organdy ribbon and layered underneath with Very Vanilla seam binding; it is just a fun accent that reminded me of a corsage. And then the box is decorated with a Designer Series Paper belly band and a simple image. Another versatile project—you can switch out the greeting for any number of sentiments to suit the situation. If you’d like to see some other Sale-A-Bration projects, click here to see the winners of the Celebrating Sale-A-Bration Creative Challenge last month! Congratulations to those creative winners! We’ve only got a few more days of Sale-A-Bration. . . enjoy!